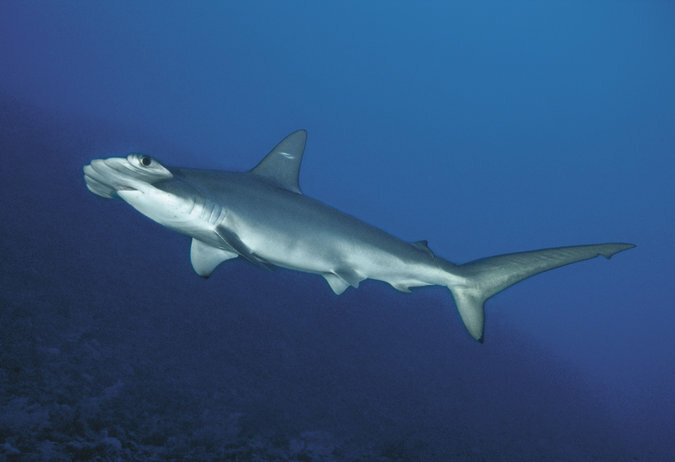 A new version of the scalloped hammerhead shark (Sphyrna lewini) has been found. Almost certainly a new species, the fish has been hidden among the endangered scalloped population, just off the southern Brazilian coast and elsewhere off the US Atlantic coast. Both species must be at least as endangered as the scalloped hammerhead which was already threatened. Misidentification has led to doubts about which of the species can be the most endangered. One could be almost extinct, with the huge shark fin market feeding the Chinese restaurant trade. The overfishing has given rise to ecological problems, as it has with many sharks worldwide. The US east coast now has very few bay scallops or scallop-fishermen, because of the rise in numbers of the predatory cow-nose ray (a shark relative, of course). This ray has few of its own predators left, as sharks have been more than decimated in the western Atlantic. Hence, a huge population explosion! The time at which these two species split from a common ancestor is 4-5 million years ago. In that time, the genome (both nuclear and mtRNA) has now given away the cryptic species as distinct while the number of vertebrae has changed, with 20 fewer in the "new" species, resulting in a mere 170. They look identical, however. The other two species, the smooth hammerhead (found up to 4.0m) and the great hammerhead (found up to 6.1m) are distinguished by their size and cephalofoil shape. The cephalofoil is the unique and wonderful head which resembles an axe in the smooth hammerhead and lacks a central indent. The two scalloped species (found up to 4.0m) both have "scallops" on the leading edge of the cephalofoil and a dusky olive dorsal coloration. Finding out what is happening in Brazilian waters at the moment is imperative to discover if this new species can be retained in an extant state. The biodiversity of the hammerhead genus is at stake, if one quarter of the species disappear as soon as they have been discovered. Other endangered animals around the world could well be located with these genetic investigations, but the fate of the large hammerheads should in future be an object lesson on how to deal with conservation of biodiversity, commercial interests and above all, greed.